Hybrid electric black cabs are officially ready to take to the streets of London, while preparations are underway in Yokohama, Japan for an autonomous e-mobility trial. After several months of testing, the London EV Company’s (LEVC) TX taxi has been fully certified and can start taking its first passengers. The hybrid vehicle features a battery electric powertrain with a small backup petrol generator. It has an overall range up to 400 miles, with an 80-mile pure electric range. The six-seater cab also features a filter system to remove gases and particles from incoming air, as well as a sensor that closes the external air intake when it detects elevated levels of pollution. “After extensive testing, LEVC’s new taxi is ready to do the job it was made for: transport people around this great city of London safely, cleanly and stylishly,” said Chris Gubbey, CEO of the LEVC. Meanwhile in Japan, a new trial is going a step further than the TX, removing the driver completely and offering autonomous electric mobility to passengers. 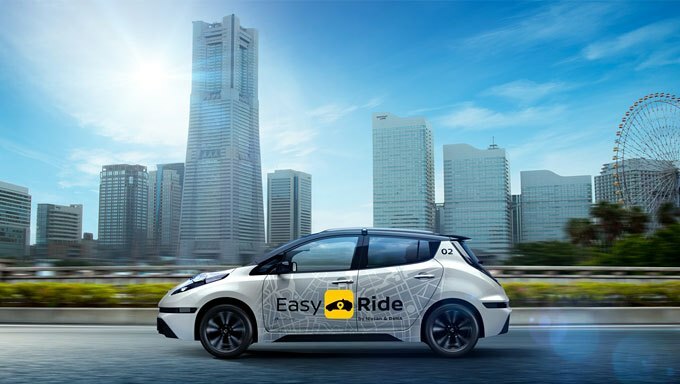 EasyRide, taking place in the Minatomirai district of Yokohama, is being run by Nissan and DeNA, a Japanese e-commerce and telecoms company. Using a mobile app, passengers will be able to summon autonomous vehicles, set destinations and pay fares. Customers will also be able to select recommended local destinations and sightseeing routes. The field test will get underway in March 2018 and the two companies are currently recruiting participants. Well done LEVC – I don’t think the world has woken up yet to all the impracticalities in total EVs in term of electrical generation, distribution, charging and convenience – and batteries themselves are horrible, toxic, life-cycle limited, use rare elements and are difficult/impossible to recycle. I see fossil/synthetic-fuelled hybrid systems as the only viable long-term solution outside the city centres where air quality is the over-riding consideration. Fast development work, hope that it proves a winner. Does the petrol generator charge the battery and thus allow the battery to supplement the power if the generator is small (as described)? Even if the electricity is free, how does the extra cost of using petrol over 80% of the 400 mile range compare with a modern diesel? Would be very interesting to see more technical details of the power unit, emissions and data etc, as otherwise this is just a sales pitch. A fuel cell using LPG to charge the battery pack would be more economical. LPG about 60% of the cost of petrol (lower calorific value) and pretty well zero emissions. LPG tanks and vapourisers proven technology and LPG available at some (not all) petrol forecourts. Your article says “a small backup petrol generator”. I Goggled it and found that it has a not especially small 1.3L petrol engine. My petrol only car has a 1.4L engine. So they have only reduced the engine by 7%. If I’m on a dual carriage way with 4 passengers and the traffic speed drops to 40mph at the start of a steep hill, then the traffic speeds up, the car feels under powered. I have to change down to third, but it still takes a long time to get back up to 70 mph whilst on a steep climb. Everywhere else, 1.4L is more than adequate. I would expect a “backup” engine for an urban car to be a lot smaller. It’s a range extender, once you’ve used up the 80 miles of electric only range the petrol range extender kicks in and recharges the battery, it does not drive the wheels directly. I expect that savvy Cabby drivers will maximise their Electric only driving range by DC Fast Charging on their 30 minute lunch break so that they rarely need the range extender apart from commuting in and out of London back to their homes.